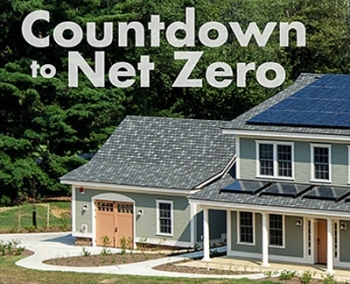 Heading into the final stretch of a year-long trial run, the experimental net-zero energy house at the National Institute of Standards and Technology (NIST) in Gaithersburg, Md., must overcome an energy deficit of 154 kilowatt hours—equivalent to about $20—during the month of June. The facility was designed to produce at least as much energy as it consumes over the course of a year. At the end of May, the research residence still owed on its total energy bill, which averaged less than $2.00 a month over the first 11 months. In contrast, the monthly expenditure for electric power alone averaged $129 for Maryland households in 2012, according to the U.S. Department of Energy. So, the "countdown to net zero" is on. For those interested in keeping score, NIST is posting a running daily tally of net energy use through June 30. Each day's results will be reported on NIST's NZERTF web page, under Recent Research Results, and highlighted on NIST's Twitter account (use the hashtag #Countdown2NetZero).